Share market Highlights: The domestic stock markets witnessed an extremely choppy session, with the Sensex and Nifty reeling under extreme pressure on Friday afternoon amid a global sell-off. Sensex closed 689.60 pts lower to 35,742.07 while the Nifty 50 closed at 10,754.85. Share market Highlights: Sensex is down 560 pts to 35,871.34, while the Nifty is trading below 10,800-mark. Share market Highlights: The domestic stock markets witnessed an extremely choppy session, with the Sensex and Nifty reeling under extreme pressure on Friday afternoon amid a global sell-off. Sensex closed 689.60 pts lower to 35,742.07 while the Nifty 50 closed at 10,754.85. Bluechips stocks plunged in trade, with shares of RIL, Infosys, ICICI Bank and HDFC contributing to Sensex’s losses. Shares of India’s largest automaker Maruti Suzuki fell by more than 3.3% to hit 7,555 on BSE. Infosys share price plunged more than 2.5% to Rs 650. Wipro share price tanked by more than 3.1% to Rs 323.15. Meanwhile, global stocks were sailing into Christmas on a sea of red on Friday, as the threat of a US government shutdown and of further hikes in U.S. borrowing costs inflamed investor unease over the economic outlook. The S&P 500 was heading for its worst quarter since the dark days of late 2008, with a loss of 15 percent so far. The Nasdaq has shed 19.5 percent from its August peak, just shy of confirming a bear market, Reuters reported. We bring to you live updates. The domestic stock markets witnessed an extremely choppy session, with the Sensex and Nifty reeling under extreme pressure on Friday afternoon amid a global sell-off. Sensex closed 689.60 pts lower to 35,742.07 while the Nifty 50 closed at 10,754.85. Bluechips stocks plunged in trade, with shares of RIL, Infosys, ICICI Bank and HDFC contributing to Sensex's losses. Shares of India's largest automaker Maruti Suzuki fell by more than 3.3% to hit 7,555 on BSE. Wipro share price tanked by more than 3.1% to Rs 323.15. A look at Sensex heat map at close. "I would be cautious on extrapolating this scenario into the future. We must remember that oil prices started coming down post of the deferment of the Iran sanctions. That would come up for review in May and there can be a turnaround. The future of rupee depends on two things: our balance of payments position – in net terms do our forex reserves increase or decrease. This depends on CAD and FPI mainly. Growth in exports and software matter here. presently we cannot be sure that these will be buoyant. For FPI the Fed action indicates rates will be high and flows to debt will be constrained. The second is how strong the dollar will be. This year the dollar strengthening drove all EMK currencies down. We cannot be sure here," Madan Sabnavis told FE Online. Shares of NDTV surged on Friday afternoon, and were locked at the upper circuit of 10% on BSE after its digital arm NDTV Convergence signed a five-year deal worth Rs 300 crore with New York-based content discovery and advertising platform Taboola. The media firm’s stocks surged 9.94% to Rs 39.25 a piece on the BSE, while the NDTV scrip was locked at Rs 39.15, up 9.97% on National Stock Exchange. “The five-year deal ties NDTV Convergence exclusively to Taboola and involves a minimum guarantee of more than Rs 3 billion for NDTV Convergence, making it one of the largest deals not just for digital content but for the media space in its entirely,” NDTV said in a press release. A few days ago, Chairman of India’s largest lender State Bank of India (SBI), Rajnish Kumar, said that loan waivers are not a permanent solution; instead, he argued for an investment scheme to increase the income of farmers on similar lines of Telangana’s Rythu Bandhu. Even Ashok Gulati, a noted agriculture economist, said in a column in The Indian Express that “politicians need to move from price support policies or loan waivers to income/investment support on a per acre basis”. The domestic stock markets continue to reel under immense pressure with the Sensex and Nifty extending losses on Friday afternoon amid a global sell-off. Sensex is down 590 points to 35,841.87, while the Nifty is trading below 10,800-mark. Bluechips stocks plunged in trade, with shares of RIL, Infosys, ICICI Bank and HDFC contributing to Sensex's losses. A look at live Sensex heat map. After opening with mild losses, the domestic stock markets turned choppy and extended losses on Friday afternoon, as a global sel-off spooked investors. Sensex is down 380 pts to 36,050.47 while the Nifty is trading below 10,850 level. Bluechips stocks plunged in trade, with shares of RIL, Infosys, ICICI Bank and HDFC contributing to Sensex's losses. Shares of India's largest automaker Maruti Suzuki fell by more than 3.3% to hit 7,555 on BSE, emerging as the biggest loser in the Sensex. A look at LIVE Sensex heat map. Gold prices steadied on Friday, holding firm near a six-month high struck in the previous session, as the dollar remained under pressure due to a subdued outlook towards U.S. interest rates and the economy, and investors shunned risky assets. Spot gold was down marginally at $1,259.16 per ounce, as of 0417 GMT, after jumping more than 1 percent in the previous session. The precious metal hit a high of $1,266.4 on Thursday, a level last seen on June 26. The bullion has gained about 1.7 percent so far this week, in what would be its second weekly gain in three.U.S. gold futures declined 0.4 percent to $1,263.3 per ounce on Friday. 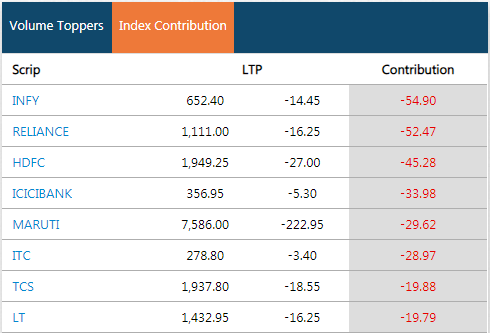 Benchmark indices witnessed a sharp selloff in late morning trade Friday as heavyweights in realty, banking, IT and auto sectors bled as investors began booking profits in bluechip stocks. Negative global cues amid fears of a potential US government shutdown and rising tension between the US and China, too, weighed on investor sentiment, according to a PTI report. After plummeting over 400 points, the 30-share Sensex was trading 372.44 points, or 1.02 per cent, lower at 36,059.23 at 1100 hrs. The NSE Nifty, too, was trading 120.25 points, or 1.10 per cent, lower at 10,831.45. A look at live heatmap. After opening slightly lower, the domestic stock markets turned choppy and extended losses, tracking weak global cues. Sensex is down 430 pts to 36,002.39, while the Nifty is trading below 10,850 level. Bluechips stocks plunged in trade, with shares of RIL, Infosys, ICICI Bank and HDFC contributing to Sensex's losses. A look at live Sensex heat map. Even as other consumer goods manufacturers saw a healthy sales growth in FY18, Patanjali Ayurved posted a flat growth – a dip for the first time in 5 years. However, the homegrown firm doesn’t consider it to be a major concern. Since company was involved in a major planning to improve sales, future investments and improving distribution network last fiscal, a slight plunge in revenue growth is obvious, Acharya Balkrishna, MD, Patanjali Ayurved told ET Now. Adding, he said that GST, demonetisation also had an impact on the FMCG sector’s growth. In FY18, while HUL recorded 12 per cent revenue growth, ITC and Nestle posted 11.30 per cent and 10.50 per cent growth, respectively in the country. The rupee fell by 37 paise to 70.07 against the US dollar in early trade Friday amid strengthening of the US dollar against some currencies overseas and foreign fund outflows. Forex traders said besides increased demand of the US currency from importers, the dollar’s strength against some currencies overseas weighed on the rupee. The rupee opened lower at 69.93 against the dollar and dropped further to quote at 70.07, 37 paise down over its previous close. On Thursday the domestic currency appreciated by 69 paise to close at 69.70 against the US dollar. Sensex and Nifty have turned choppy in the morning trade owing to steep declines in heavyweight stocks such as Reliance Industries, Infosys, HDFC, ICICI Bank. Bluechip stocks are reeling under heavy pressure, with Infosys, RIL and HDFC emerging as the top draggers in Sensex. RIL share price plunged by more than 1.7% to intra-day low of Rs 1,109.95. Infosys plunged by more than 2.5% to Rs 650.40. HDFC shares plunged by more than 1.5% to Rs 1,945 on BSE. ICICI Bank share plunged by about 2% to hit the day's low at Rs 355.40. A look at index contributors. After opening mildly lower, the domestic stock markets extended losses on Friday morning, tracking weak global cues. Sensex is down 367 pts to 36,063.99, while the Nifty is trading below 10,850 level. Shares of India's largest automaker Maruti Suzuki fell by more than 3.3% to hit 7,555 on BSE, emerging as the biggest loser in the Sensex. Yes Bank shares too posted a decline of 2.7% to Rs 181.55. Capital market regulator Securities and Exchange Board of India (SEBI) is planning a ‘sandbox policy’ to support technology developments in financial markets. “We will come out with a sandbox policy. We are examining whether any changes in laws are required in terms of its dispensation,” SEBI Chairman Ajay Tyagi said on the sidelines of an event organised by IIM-Calcutta. How will this new policy benefit tech companies? The ‘sandbox’ policy is being planned in order to bolster innovation in the capital markets by technological intervention. Notably, the Sandbox policy will allow companies to test products in a closed environment, a particular geography or among a set of users, before they are allowed roll out commercially meeting all regulations. SEBI Chairman Ajay Tyagi noted that this will enable the tech companies to work on innovations without regulatory changes. He said there had been huge technology interventions in capital markets in the past and it would continue. Shares of India's telecom major Bharti Airtel gained in trade on Friday morning, after the firm announced that it will sell 32% stake in Bharti Infratel. Notably, Bharti Airtel has decided to sell a further 32% stake in Bharti Infratel, valued at close to Rs 15,500 crore at yesterday's closing prices, to create a war chest to bolster its countrywide 4G networks and counter Mukesh Ambani's Reliance Jio Infocomm. Separately, the Sunil Mittal-led telco on Thursday also appointed a panel to explore various other fundraising options. The committee will place its recommendations before the company’s board for final approval, Bharti Airtel said in a filing to the exchanges. On a net basis, foreign portfolio investors (FPIs) sold shares worth Rs 386.44 crore Thursday, and domestic institutional investors (DIIs) were net buyers to the tune of Rs 87.96 crore, provisional data available with BSE showed, PTI reported. Benchmark indices opened on a choppy note Friday on negative global cues amid fears of a potential US government shutdown and rising tension between the US and China. After falling over 100 points in opening session, the 30-share Sensex was trading 14.82 points, or 0.04 per cent, higher at 36,416.85. The index had finished 52.66 points, or 0.14 per cent, lower at 36,431.67 Thursday. The NSE Nifty, too, was trading 2.25 points, or 0.02 per cent, lower at 10,949.45. The domestic stock markets--Sensex and Nifty opened mildly lower on Friday morning tracking weak global cues. The 30-share Sensex opened 18 points lower at 36,449.27.27, while the broader Nifty 50 opened below 10,950-mark. Bharti Airtel share price gained by more than 2% to Rs 324. The firm is slated to sell 32% stake in Bharti Infratel. A look at live heatmap. U.S. stocks slid on Thursday, with the Nasdaq on the cusp of confirming bear market territory, as the Federal Reserve’s plan to continue its balance sheet reduction and the threat of a partial government shutdown fueled investor anxieties. At its session low, the Nasdaq had tumbled 2.85 percent, pushing the tech-heavy index more than 20 percent below its Aug. 29 closing high. The index, along with the Dow and the benchmark S&P 500, pared losses as the session continued. The Nasdaq ended down 19.5 percent from its closing high, just shy of confirming a bear market. Global stocks were sailing into Christmas on a sea of red on Friday, as the threat of a U.S. government shutdown and of further hikes in U.S. borrowing costs inflamed investor unease over the economic outlook. The S&P 500 was heading for its worst quarter since the dark days of late 2008, with a loss of 15 percent so far. The Nasdaq has shed 19.5 percent from its August peak, just shy of confirming a bear market. Oil prices climbed on Friday after tumbling 5 percent in the last session, with OPEC production cuts that start next month seen being deeper then previously expected. Benchmark Brent crude futures were up 1.51 percent at $55.17 per barrel at 0112 GMT, recovering from losses of $2.89 per barrel the session before. U.S. West Texas Intermediate (WTI) crude futures rose 1.53 percent, or 70 cents, to $46.58 per barrel. The Organization of the Petroleum Exporting Countries plans to release a table detailing output cut quotas for its members and allies such as Russia in an effort to shore up the price of crude, OPEC’s secretary-general said in a letter seen by Reuters on Thursday. The dollar hovered near a one-month low against its peers on Friday, weighed down by a subdued outlook towards U.S. interest rates and the economy, while risk aversion in the broader markets boosted the yen. The dollar index against a basket of six major currencies stood near 96.30 after falling to 96.168 overnight, its lowest since Nov. 20. The index has lost roughly 1.2 percent this week. The greenback has slumped after the Federal Reserve signalled fewer interest rate hikes over the next few years than it previously projected and helped push long-term U.S. Treasury yields to near nine-month lows. Share market on Thursday: After trading lower on Thursday morning, the Sensex and Nifty made a smart recovery in the afternoon trade. Sensex recovered more than 200 pts from day’s lows to close at 36,431.67, while the broader Nifty 50 closed above the 10,950-mark. Notably, as compared to Wednesday’s close, the Sensex closed 52.66 pts lower or 0.14%. Yes Bank share price gained by more than 4% intra-day after the firm announced that it has sold over 2% stake in Fortis Healthcare Ltd (FHL) in tranches. Shares of India’s major automaker Maruti Suzuki slumped by more than 1.7% to hit Rs 7,800, after the firm cut sales growth forecast 8%, and said that double digit sales growth in FY19 is unrealistic. Jet Airways shares gained more than 1% ahead of its board meet today to discuss fund raising options.